Caregivers encourage patients and their families to use free self-expression through various creative medians as a form of psychotherapy. At Winship Cancer Institute of Emory University, we are dedicated to healing the patient's overall health and personal sense of well-being. To better aid our patients, with the help of our caregivers, we have organized art therapy programs for patients, their families, and the entire Winship community. Feeling of a safe space to explore and express thoughts and emotions. Our Arts in Health Program at Winship strives to provide patients with different experiences including participatory and environmental arts. Whether they are engaged in painting, jewelry making, drawing, writing or enjoying musicians, art exhibits, and visual art demonstrations, patients are offered a variety of activities that enhance their experience while in treatment. Are you an artist? Are you creative? 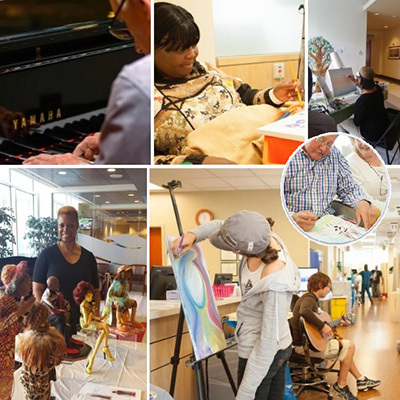 Volunteer to share your talent with patients, family members and caregivers at Winship in our Arts in Health therapy program. Please contact Volunteer Services for more information. Additional volunteer requirements apply to this opportunity.